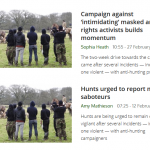 We decided to dedicate an entirely separate page for ‘myths’ as they span legal, pro-hunt and anti-hunt and various other issues, so there wasn’t another place that made sense for the page. Plus, it seems pretty important to get some answers to certain questions out there! When it comes to answering questions about sabs, we can only speak for ourselves at Three Counties Sabs. Some things are more general, other things are entirely down to the individual person, though to a large extent 3C Sabs work well together because we have similar ideas about tactics, ethics and so on. Contrary to popular belief, not every sab or activist agrees with absolutely everything others do, same as pro-hunt people, vivisectionists and so on. We try not to generalise or use stereotypes when talking about hunters, supporters, farmers, etc. and we hope others are mature and sensible enough to do the same. But we do get ‘reviews’ on our facebook page that are obviously not about 3C specifically, but are based on stereotypes or other ideas people have about sabs or animal liberation activists. Maybe some people are involved in anti-hunt campaigning for ‘class-war’ reasons, but the majority, if not all, of the anti-hunt people who we know are not. Some people campaign strongly against hunting because they see it as a ‘flagship issue’, that if people are still hunting animals for fun, how will we manage to educate them about other animal suffering on issues that are deemed ‘necessary’ like eating / testing for medical reasons and so on. To understand why hunting should not be a class-war issue, it is important to understand how hunts actually work. We will be putting up an article with a general idea of hunt structure in more detail soon. In short, not all people who hunt are upper-class or rich. While the masters of a hunt tend to have money (they are the ones who will end up bailing the hunt out if they run low on funds) and some followers are wealthy enough to spend the majority of their time out with hunts or shoots, the huntsman himself (along with whippers-in, terriermen and other hunt staff) are employed by the hunt. Many are in tied cottages and, if they leave one hunt and cannot find work with another, may find themselves and their families homeless. Some huntsmen will have money, others will not. 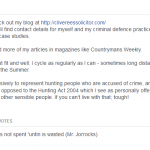 Lee Peters, ex-huntsman and master of the Ross Harriers hunt, lived with his family in a portacabin next to the kennels. 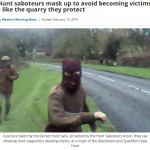 For all of the sabs in 3C, being anti-hunt is not a class-war issue. While none of us are particularly wealthy ourselves, we do know people who are anti-hunt and / or who would be classed as “upper-class” if we cared about such labels. We don’t. It’s about the animals, not an argument relating to what ‘class’ label we can place on someone or how much money someone has. Firstly, the spray bottles we carry contain a heavily-diluted mixture of citronella essential oil (used by many who have horses to keep away flies) in water. Our own sabs have sprayed themselves in the face with it in front of hunters to show them it is not harmful. It is a strong-smelling substance that we use to try and ‘foil’ the scent of a fox if we can get between the hunted animal and the hounds. Secondly, there is no need to spray hounds with the substance and the only time a hound has been sprayed by one of our sabs was when a fox had broken cover on to a road and the sab was spraying the hedge before hounds came through and one suddenly popped his head through a gap, catching the edge of the mist. He shook the liquid from his neck and carried on searching for the scent. As for calling hounds on to roads, we would never do that. Our sabs have been known to offer first aid to injured horses, hounds and humans alike – it is not about caring about an individual fox or hare (or other hunted animal) over other life – it is about trying to prevent suffering and that includes caring for the welfare of hounds (and the humans and horses). We carry wire-cutters to help cut horses or hounds out of wire when they occasionally get tangled up, first aid kits are always in the car and we’ve slowed down many a stream of traffic in order to stop hounds or loose horses from getting hit as well as catching them and returning them to the hunt / supporters. Because we can’t prove a negative, we await such allegations that are actually backed up with evidence and we shall be available for comment if such time ever occurs. Which it won’t. Apart from being able to put pictures of blocked setts online where other anti-hunt people will generally believe us and many pro-hunt people will say that it’s not a sett / not blocked / not active / that we blocked it ourselves the hunt would not be able to get in trouble unless there was footage / photos or other evidence that they were the culprits. Therefore we would be completely wasting our time and energy blocking setts with nothing to gain from it as if we did it, there would be no evidence that they did it. Stupid argument, doesn’t require any further explanation as to why. We do not claim that all hunts who were chasing foxes before the ban are now illegally hunting – some may well lay false scents for the hounds to follow. But we know the hunts that we go to are breaking the law, chasing and killing foxes and hares and other wildlife, many blocking badger setts and so on to boot. We wouldn’t bother going to them if they were not causing suffering to wildlife. 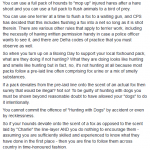 Many hunt supporters (and hunters themselves when questioned by the police) claim that hunts are now drag-hunting. 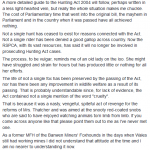 Drag-hunting is actually a separate event to what has become known as ‘trail-hunting’ and dates back to the 19th century (not 2005 when the Hunting Act came into force). More info can be found on our site here. Hunt Monitors do what it sounds like. They monitor hunts for illegal activity such as digging-out foxes which they have run to ground or indeed ‘just’ chasing foxes. The League Against Cruel Sports are one example of an organisation which does this, as are the independent Hunt Monitors. 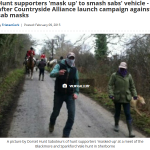 Saboteurs sabotage hunts and many have been doing so even before the Hunting Act came into force. Many of them will continue to do so even if the Act is repealed because it is not about upholding the law, but about saving or helping wildlife. Many of us grew up / live in the countryside. Some of us are ex-hunt ourselves. Some of us believe that ‘countryside practices’ can be as harmful to the environment as many that take place in the cities. Just because we disagree with something that happens in the countryside, it does not mean that we don’t understand it. Many of us don’t class ourselves as “animal lovers”. We don’t necessarily ‘love’ non-human animals any more than we ‘love’ elderly people, children, refugees, those living below the poverty line, prisoners… but when those ‘groups’ of people are facing cruelty or injustice, something should be done about it. Going by many definitions of that word, so are humans. Non-human animals tend to regulate their numbers a lot better than humans do, even those without natural predators, based on resources available to them and their current situation – if there’s not enough food to live on yourself, you’re probably not going to want to bring more mouths to the table, so to speak. Yes, foxes kill chickens and sometimes go after larger animals like lambs if they’re really hungry, but we destroy and ‘manage’ their natural environments, kill and ‘manage’ their prey species and breed and lock up other animals generally to kill them ourselves. In general, a fox, like many other predators, will only use the energy to kill what they need for survival. Unlike humans. We’re not going to spend long on this one. Most of our sabs really dislike the word “cute” to describe any animals and it would disrespectful to only care about something based on how ‘cute’ or ‘fluffy’ it is. We don’t particularly think children are cute or fluffy, but would intervene to stop them suffering if we could. Despite little first-hand experience, we’re pretty sure Syrians aren’t exactly ‘cute and fluffy’ but have a huge amount of respect and support for a mate of ours who is in Syria currently defending an area against ISIS. One of our sabs picked up an ill slow-worm which then recovered at another mate’s house last year (not the most ‘cute’ or ‘fluffy’ creature in the world by most standards). In short, what a stupid thing to say. Let’s move on. There is actually nothing illegal about filming children unless the images you are recording are indecent. Even the Telegraph says so in this article. However, to put hunt-supporting parents’ minds at ease, we do not film children unless we need to. We wouldn’t be filming them just for the sake of it, but if, for example, a child of 11 was riding their horse repeatedly at one of our sabs and trying to kick them in the process while being egged on by other children of a similar age, we would film them (and we did in this situation as it actually did happen one day). They are above the age of criminal responsibility and we would not hesitate to report them to the police like any other person doing the same. If we happen to be filming hounds picking up on the scent of a fox and you tell your child to ride their pony in the way (or they just happen to ride or walk into shot) we’re going to keep filming. And it won’t be illegal to do so. We, of course, would try to film around them, not at them (they’re not exactly what we want on film) but it can’t always be helped. We’re happy to try and blank out faces if this happens or we’re asked (politely) to. Unless it’s Sam from the Ledbury Hunt as he is a whipper-in and therefore part of the hunt. No. Trespass is unlawful. It means it is not allowed by law. But it is not prohibited by the law (however much they tried back in 1994). It is a civil matter not a criminal offence. In addition, we only trespass if we need to. Don’t break the law by hunting / digging-out, we won’t have any need to trespass (or, indeed, come to your hunt). Both statements are ridiculous because they suggest that all foxes die in those ways. Many pro-hunt people argue that all foxes are killed quickly by hounds, which cannot be guaranteed in all cases. Saying that foxes all die a slow painful death in the jaws of the hounds is also a generalisation which isn’t true in all cases. Both statements will be true in some cases. 3C sabs never guarantee a “no-kill” day because we rarely have all of the hounds and terriermen in sight for the entire day and therefore do not know if they have killed. We wrote this in a report once, saying that it can only take one hound a couple of seconds to kill. Suddenly we had anti-hunt people messaging us to take the comment down as “it does no good to your cause” and pro-hunt people sharing the report saying we’d finally figured out that foxes are killed quickly. So, we’ve covered the fact that neither statement is true in all cases, so why did we not remove the comment from the report? Because it’s true that it can only take one hound and a couple of seconds to kill. A fox could pop up right in front of the hounds and be chopped. There could be an ill, weak or injured fox, easily caught and who doesn’t fight back. A fox could panic and turn into the pack. The hounds could just be very efficient killers. Or lucky. A person could shoot another person “quickly and efficiently” in the street and they could die in seconds. That wouldn’t make it ok. We’re not animal welfarists… we’re not ok with an animal being killed unnecessarily just because someone tells us it was quick or they didn’t suffer much. Some sabs are on benefits for various reasons. None of our sabs currently are. Many are self-employed (meaning we can work around sabbing days), others employed in a variety of jobs, some are probably stinking rich and don’t have to work any more (but unfortunately that’s not the case in 3C). Despite the fact that we’re constantly trying to rehome animals from shelters who have been neglected or abandoned, we’re pretty sure we could find people who could take on a hound or hounds and give them a fulfilling life. Yes, it probably wouldn’t be quite as exciting as running around chasing other animals with the rest of your pack with you, but if pro-hunt people don’t want the hounds to be killed as a priority, there are ways to avoid that. Badly-written? Yes. Open to interpretation? Yes. Strongly enforced? No. 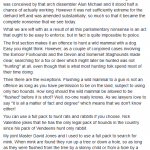 This doesn’t mean it’s unworkable, it just means that it needs to be written more clearly so all involved – hunts, antis, police and the courts – can actually work out what is allowed and what is against the law. Check out our write-up on the Hunting Act and the Gamekeeper’s Exemption on what is legal and illegal. 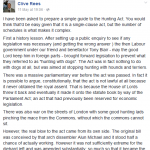 Pro-hunt solicitor Clive Rees (who ‘defends the undefendable’) has also written a piece about the Hunting Act and its complications (see below). However confusing it is at the moment, this is not a justification for getting rid of it in its entirety. It just needs tidying up! This isn’t true as there are exemptions included in the Act itself and it also does not include a ‘recklessness’ clause. To explain, the Damage Act regarding criminal damage covers 2 types of offence: intentional and reckless. Reckless criminal damage would be doing something which was pretty obviously going to end in something being broken. There’s no similar offence under the Hunting Act, so sabs and monitors would have to prove that the hunt were intentionally giving chase to a fox if a case arose. Said about pro-hunt people by anti-hunt people and about anti-hunt people by pro-hunt people. 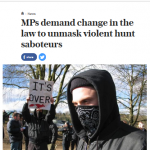 There are many different reasons why someone might mask up, including the reason most anti-hunt people do which is to protect their identity. Not necessarily because they’re already on bail for other offences or because they’re wanted by the police, not because they’ve done or are planning to do anything illegal, not because they want to get away with something. But because they don’t want the other side to know who they are. People on all sides of the argument have had personal details and pictures put online – our sabs have been visited at home, called repeatedly and people we know have had dead foxes thrown on to their lawns or put on top of their vehicles and others have had their animals killed. Nowhere does this state that the wilful destruction or damage has to be illegal. Someone once said that the police do not ‘sabotage’ terrorist plots, but that they ‘foil’ them instead. Fine, we’ll become Three Counties Hunt Foilers then. It fits nicely, especially as ‘to foil’ [a scent] is a hunting term. Perhaps there are some people out there who are – we can’t claim to know every anti-hunt person in the world – but we certainly don’t know anyone like that ourselves. Anyone who is just looking for a group to belong to or a way to express their anger will probably not last very long in any of our groups considering how much time and energy is usually involved in what we do. If people are being seen as “rent-a-mob” because they happen to be involved in more than one campaign (which has been said to us in the past with regards to anti-animal testing campaigns and sabbing) then that’s just silly. Very few people in the world will only have an opinion on one thing alone and be entirely single-issue. We are perfectly capable of being anti-hunt and anti-vivisection or anti-hunt and anti-fascist without it meaning that we’re just getting involved in lots of different things without caring about any of the issues. Again, with the amount of time and energy usually put into various campaigns, anyone just hopping between campaigns is probably not going to be around for long. No sab we know gets paid to go out and we certainly don’t. 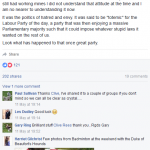 Most sab groups get sabs to chip in some money towards fuel for the day and do group fundraising such as using online platforms to put out appeals for donations or going to car-boot sales or doing ‘workers beer’ at festivals. So we actually pay to go sabbing… Any money you see changing hands in the field is probably someone handing over some group funds for fuel costs that they’ve just drawn out of the bank or chipping in some money to a less-well-off friend. As for getting paid in sandwiches, we’d be well up for that if anyone would like to volunteer. Otherwise we’ll keep making our own.